Although we had an old caravan for many years we had no idea what interior layouts were practical in a van conversion. If you are used to a caravan the one thing that is noticeable is the van's narrower internal width. We scoured the popular magazines, such as Motorcaravan and Motorhome Monthly, and the internet for information and ideas. (Whilst the popular motorhome magazines are useful for ideas on layouts, they don't often feature self-built vans). In October 2007 we went to the NEC Birmingham motorhome show and spent most of the day on our knees poking inside cupboards and under van floors to discover where the gas cylinders had been hidden! It was all useful information. The NEC visit confirmed our intention to build our own as the appliances and fixtures we'd need were readily obtainable from specialist suppliers. We were not impressed with the quality of workmanship and materials used in some vans. In our case it wasn't too difficult to decide on the layout. We had no special requirements and many new vans had the layout we liked, so we'd copy them and adapt the basic design to suit ourselves. We would use the same type of van that professional converters use. Of course, it's all been done many times over - but that doesn't mean doing it is easy for the amateur - there is a steep learning curve. The important thing for us to bear in mind was being able to park off-road in the front garden to avoid the threat of controlled parking zones and, if a diesel, it had to meet the low-emissions requirements. Who will do the work? What will it cost if I don't? where can I do the work? If I don't do all the work, what will it cost if I use a professional and what timescales are involved? 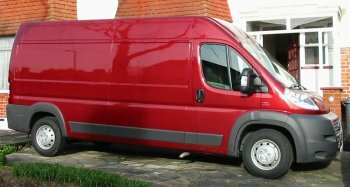 Whilst using a local tradesman, say an electrician to fit mains power, wouldn't be hugely expensive, getting a reliable bespoke van conversion company to build, perhaps just parts of your van, is likely to add a significant cost to the budget, and possibly add many months to the build in delay before the work can be done. One needs to research this carefully to avoid financial surprises! It seems that over the years almost any type of vehicle has been converted into a home on wheels! 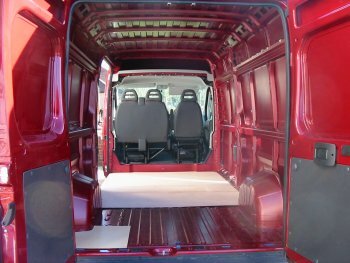 Panel vans are probably the most popular. We looked in Autotrader magazine and on-line; there were plenty of choices from new to well-used ones. Spares for popular models from breakers were relatively cheap and easy to obtain. The main disadvantage is, being a commercial vehicle, most have had a hard life and serious rust is never far away. We looked and looked for a low-mileage van; it got to the point where a good main-dealer forecourt example, 2 years old with 25k miles on the clock including warranty, was only a fraction lower in price than a brand-new model. What the hell, for us this was a ten year investment, so we went and bought a new one via the internet from Fiat for £15k! 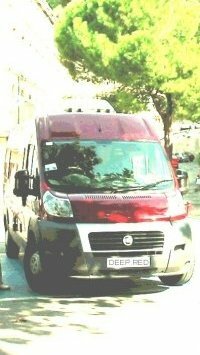 2007 Fiat Ducato Maxi, high roof, long wheelbase. Powered by 2.3 litre, 130bhp multi-jet Euro IV diesel. Gross vehicle weight 3500kg, payload 1485kg. At 5.998 metres long it just makes the lower rates on Channel ferries. 2.05m. width means avoiding those restricted narrow roads with posts set at 6ft 6in. apart. We can get a lot stuff in this baby and still have plenty of payload over for the wine. "Any colour as long as it's not white - I don't want to be called white-van-woman!" - Mad Mumsie. A pic to bring a blush of pure joy across the countenance of any self-respecting self-builder! Interior 3.705m(12ft 6in) long, 1.870m (6ft 1 5/8in) wide, 1.932m (6ft 4in) high. "Where's me jigsaw, Mad Mumsie, there's some 'oles need cutting..."